I stared at the text… “Do you want to do an Honor Flight to take a Pearl Harbor Survivor back to Pearl Harbor”? I was somewhat confused. Yes, I am an Honor Flight nurse, but we take veterans to Washington D.C. to see their memorials. It’s a VERY long day starting at 3am and ending near midnight and we keep going all day! 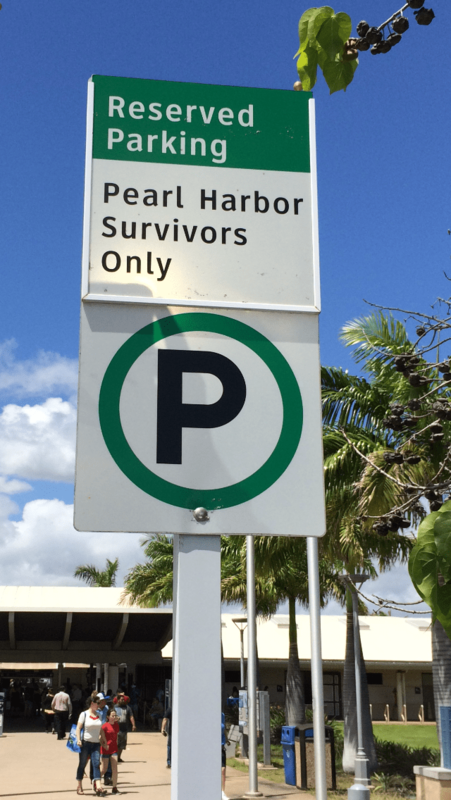 Pearl Harbor can’t be a day trip. So that would mean an overnight, right? Hawaii? Pearl Harbor? A survivor? After a few texts for clarification I was all in! The trip was scheduled and we were off to Hawaii. We landed to a surprise celebration in the Honolulu Airport welcoming Ed, a 96 year old survivor of the attack on Pearl Harbor. We traveled to Hickem Air Force Base to rest up for the Pearl Harbor tour the next day. I thought we were ready… Honor Flight Dayton was good prep… The veterans are always treated like celebrities in Washington. But those Honor Flight trips are a huge group of veterans. We were bringing just one! Ed and his Guardian and me, the nurse. We didn’t really know what to expect. We just knew it would be a very emotionally charged and potentially healing experience for him. We also knew, as empathic as we both were, it would be very emotional for us to witness. When we arrived at the parking lot we were greeted by security and given the special parking space. I touched Ed on the arm and pointed up to where the sign was. When Ed saw the sign he said, “OOOH BOY!… (long pause) I don’t know if I can do this… Maybe I should just go back home!” He struggled to maintain his composure so we just sat there for a few moments. When he was ready, we left the vehicle and began a life altering journey. His Guardian, Terri, had planned the tour for today. But we couldn’t have known to plan for the response of the visitors at the museum today! As soon as we came up the sidewalk toward the entrance, Ed was an instant celebrity. People saw his hat and gasped! They would turn to their family or friends and point to Ed. You could see their emotions in their expressions. Some were honored to shake Ed’s hand and express their gratitude for his history at Pearl Harbor. Others broke into tears and though they tried to express their feelings were often unable to utter a single word. Still others shared their stories of a family member who served during World War II or who witnessed the attack on Pearl Harbor. As visitors approached, I would step back. This was Ed’s moment… it was about him and his history and it was for him and his healing. This was his experience and it was his opportunity to allow hundreds of others to share their respect and honor for something none of us can ever understand and can only imagine. 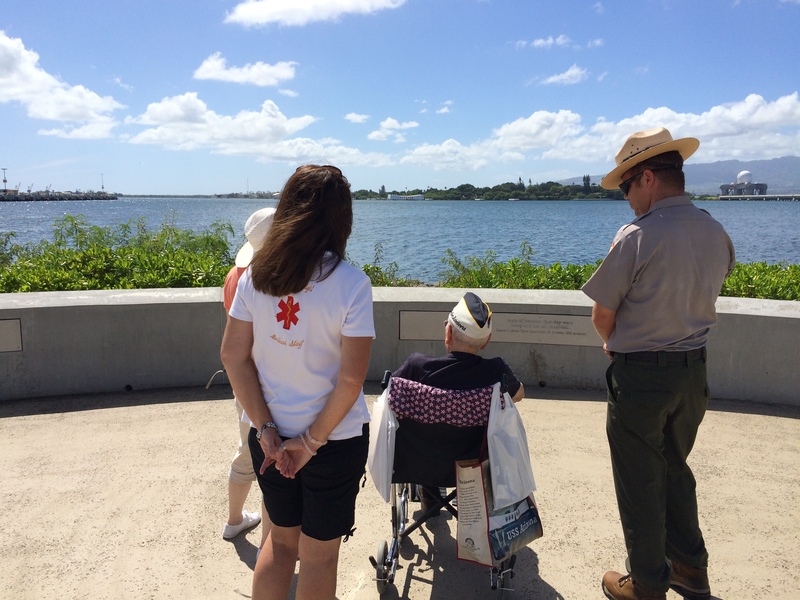 When visitors heard that there was an actual Pearl Harbor Survivor on the grounds, they sought him out. People of all ages, nationalities, and their families stepped forward to meet him and have their picture taken with him. At times, and without encouragement, children would come up to him and shake his hand! How did they know? What will they remember of this day? Ed was touched by those moments. At times, while he was engaged in conversation, others would ask me questions about him or tell me their story and their connection to Pearl Harbor. One gentleman had a grandfather who went down with the USS Arizona. A man who served post WWII had never been to the museum but had it on his bucket list. This was his lucky day and he was so thrilled to chat with Ed. Two couples from France were on the grounds. They heard a Survivor was there and they looked for him. When the women found him they were overcome with tears. They were trying to express their gratitude for what our soldiers did for them… they were children but they remember vividly! The women went to find their husbands and the four of them couldn’t get close enough and struggled to express their true feelings. They kept telling other bystanders “You have no idea…!” Though only one of the four spoke some basic English, there was no mistaking her emotions and her desire to share their gratitude. I was amazed at their level of awe.